Take an oral allergy or anti-itch medication. Options include nonprescription allergy medicines (antihistamines) — such as cetirizine (Zyrtec) or fexofenadine (Allegra). Also, diphenhydramine (Benadryl, others) may be helpful if itching is severe. But it can make you drowsy, so it's better for bedtime. Take a bleach bath. A diluted-bleach bath decreases bacteria on the skin and related infections. Add 1/2 cup (118 milliliters) of household bleach, not concentrated bleach, to a 40-gallon (151-liter) bathtub filled with warm water — measures are for a U.S.-standard-sized tub filled to the overflow drainage holes.Soak from the neck down or just the affected areas of skin for about 10 minutes. Do not submerge the head. Rinse, pat dry and moisturize. Take a bleach bath no more than two or three times a week. Apply an anti-itch cream or calamine lotion to the affected area. 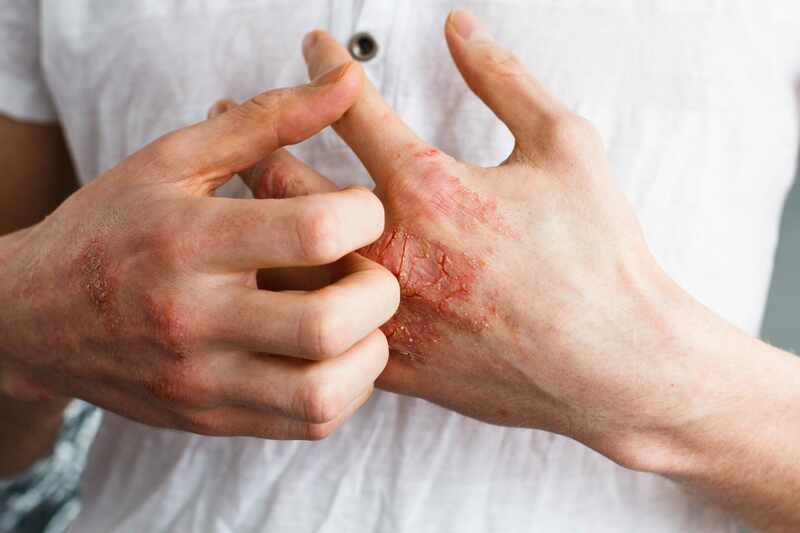 A nonprescription hydrocortisone cream, containing at least 1 percent hydrocortisone, can temporarily relieve the itch. Apply it to the affected area before you moisturize. Once your reaction has improved, you may use this type of cream less often to prevent flare-ups. Moisturize your skin at least twice a day. Use a moisturizer all over while your skin is still damp from a bath or shower. Pay special attention to your legs, arms, back and the sides of your body. If your skin is already dry, consider using oil or lubricating cream. Avoid scratching. Cover the itchy area if you can't keep from scratching it. Trim nails and wear gloves at night. Apply cool, wet compresses. Covering the affected area with bandages and dressings helps protect the skin and prevent scratching. Take a warm bath. Sprinkle the bath water with baking soda, uncooked oatmeal or colloidal oatmeal — a finely ground oatmeal that is made for the bathtub (Aveeno, others). Soak for 10 to 15 minutes, then pat dry and apply medicated lotions, moisturizers or both (use the medicated form first). Use a humidifier. Hot, dry indoor air can parch sensitive skin and worsen itching and flaking. A portable home humidifier or one attached to your furnace adds moisture to the air inside your home. Keep your humidifier clean to prevent the growth of bacteria and fungi. Wear cool, smooth-textured cotton clothing. Reduce irritation by avoiding clothing that's rough, tight, scratchy or made from wool. Also, wear appropriate clothing in hot weather or during exercise to prevent excessive sweating. Related news: Mayo Clinic Minute: Protecting babies from eczema risk.